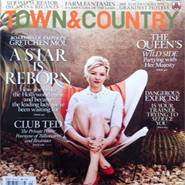 Advertisers including Tiffany & Co., Ralph Lauren, Cartier, Rolex, Chanel, Christian Dior, David Yurman and Ritz-Carlton are positioning themselves purveyors of the luxury lifestyle in this month’s Town & Country magazine that features actress Gretchen Mol, private clubs and Britain's Queen Elizabeth II. The marketers are accompanied solely by high-end brands and editorial, therefore giving off the sense of a lifestyle labels and not just brands that sell luxury products. A Town & Country position will likely move brands up in the eyes of consumers, a publication that is well-known for its affluent audience and focus on high-end brand advertisers.